The Philippines will be free of poverty and will be well on the way to sustainability by 2030. No one will be left behind. That’s the promise, that’s what our government signed up to in 2015. This report, our report, entitled “FOR JUSTICE AND SUSTAINABILITY: The Other PH 2030 Agenda”, is about taking on our government on that promise. It is an attempt by Social Watch Philippines (SWP) to present its view of the stubborn Philippine development dilemma and how it may be overcome. Through this report we offer our support and cooperation in figuring out the sustainability problem and finding lasting solutions to the cyclical problems of high poverty, high inequality and continuing environmental degradation despite or because of economic growth. The promise to put an end to poverty, reduce inequality, share prosperity with everyone, and save humanity from climate change catastrophe are contained in the outcome documents the Philippines signed up to in 2015: The 2030 Agenda for Sustainable Development and the 17 Sustainable Development Goals (SDGs) from the UN Sustainable Development Summit in New York; the Sendai Framework for Disaster Risk Reduction from the World Conference on Disaster Risk Reduction in Sendai, Japan; the Paris Agreement from the 21st Conference of the Parties to the United Nations Framework Convention on Climate Change or UNFCCC COP21 in Paris; and the Addis Ababa Action Agenda from the Third UN Conference on Financing for Development (FFD3) in Addis Ababa. The UN General Assembly created the High Level Political Forum (HLPF) as the body mandated to oversee the implementation of the 2030 Agenda and the 17 SDGs at the global level. The HLPF will facilitate sharing of experiences, including successes, challenges and lessons learned, and provide political leadership, guidance and recommendations for follow- up. It will promote system-wide coherence and coordination of sustainable development policies. It should ensure that the Agenda remains relevant and ambitious and should focus on the assessment of progress, achievements and challenges faced by developed and developing countries, including new and emerging issues. The July HLPF revolves around the theme of “ensuring that no one is left behind.” But who on earth wants to leave anyone behind, anyway? The question for us is, why the heck is anyone left behind, in the first place. Furthermore, ‘leaving no one behind’ might also turn out to mean included but exploited. For the first HLPF in July 2016, the Philippines offered to be among the 22 countries that will lead the national review and report as to how the 2030 Agenda will be translated into national sustainability plans. Strategically, the scope of national reviews at the HLPF is expected to be the whole 2030 Agenda. Since the implementation of the 2030 Agenda only started in January 2016, countries are not yet expected to be able to report on the review of the 2030 Agenda and SDGs. They could choose instead to focus on strategies and policies that are being put in place to facilitate implementation. Of course, it would be ideal if countries decide to and are prepared to share any progress and accomplishments related to activities supporting the 2030 Agenda. This would imply that they have already gone through the effort of defining a baseline for the SDGs. After all, they should have been doing sustainable development way back since the 1992 Earth Summit. 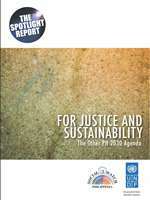 Our report, “FOR JUSTICE AND SUSTAINABILITY: The Other PH 2030 Agenda,” tries to take the challenge beyond what’s minimally expected in the July HLPF national review. There is enough reason to hope the Philippines can deliver on its promise.. The next three regimes, starting with the Duterte administration, will have to carry on where the Aquino regime left off -- a country still mired in high poverty, high inequality and continuing environmental decline, and leaving behind so many even after 24 quarters of high economic growth. On the 2016-2022 regime falls the responsibility of finding out why sustainable development still remains an aspiration after a succession of five post-Marcos democratic regimes. We need this baseline so we can plot much better how to do the right things and how to do things right. It is also requisite for tracking progress. Ending poverty and achieving sustainable development are certainly noble aspirations. The question before us is why these dreams have remained out of reach till now. How are we going to achieve them this time around? How on earth are we going to do it in 15 years after one generation of trying to deliver on virtually the same set of promises, and failing? But to answer the ‘how’ question, we need to find out why sustainable development did not happen to begin with. We would like to see the new regime’s plan as to how poverty will be eradicated and sustainable development achieved by 2030. We want to participate in the whole process, highlighting the people’s say in shaping whatever sustainable development agenda will come out of it. Social Watch Philippines is now leading a process that responds to the ‘now what’ and ‘how’ questions. We have been consulting different non-state constituencies involved in sustainable development issues. The outputs of the consultations together with sustainable development proposals and solutions developed and propounded by many groups through the years are being considered as inputs to an alternative report, our “Spotlight Report” from the civil society perspective. We will do a public presentation of this Spotlight Report to government, media and civil society organizations. One, the high levels of poverty and inequality, amidst continuous economic growth, would indicate that excluded Filipinos en masse are being denied their civil, political, economic, social and cultural rights. Two, growth not only fails to be inclusive, it is also unable to secure the jobs and employment of the included, many of whom do not even enjoy a living wage, much less universal social protection. The benefits from growth get even more concentrated in fewer hands and regions of the country. We cannot continue having one third or more of our fellow Filipinos living in poverty while a few billionaire families have got nearly everything. Three, jobless growth and massive poverty lay the grounds for the never-ending, expensive catch-and-provisioning programs like the conditional cash transfer (CCT) and Pantawid Pamilyang Pilipino Program (4Ps). A big part of financing for these programs come from World Bank and Asian Development Bank loans, adding to the mounting debt burden that would be dumped onto the next generation. Four, growth does not only come with high poverty and high inequality, it also comes with a huge carbon footprint. The Philippine economy continues to rely heavily on coal, oil and gas despite the Renewable Energy Law that mandates an increasing share of geothermal, hydro, solar, wind, and other clean alternatives to fossil fuels in the energy mix. The government has virtually abdicated its hold on power and energy to the big private corporate sector. Five, the rhetoric of “multi-stakeholderism” and “partnerships” tend to mask state responsibility for what’s happening. Unsustainable development begets human rights violations and the state as duty bearer must assume principal responsibility. They are ultimately responsible for unregulated corporate activities that harm people and their living environments. There is an urgent need to voice the different roles, obligations and responsibilities of rights holders and duty bearers as enshrined in the covenants and conventions of the human rights system. This has repercussions for the discourse on inequalities, which should not only be about income, but also about structural issues and the responsibility of the public to address them. “Universality” needs to be understood within the principles of equity and common but differentiated responsibilities. To emphasize the “common” at the expense of “differentiation”, as in the case of the Paris Agreement, compromises the commitment to reduce inequality. There are greater duties and responsibilities for the rich and powerful, including extra- territorial obligations, which need to be taken in to account. Six, to address the risk of getting trapped in limited agendas by others, work should be centered on self-identified priorities and wanted outcomes, including on formulating alternative policies. This includes the need to take an alternative approach to working on and with indicators: Are there indicators to better capture what should be measured instead? What are structural and political obstacles to be addressed within and around the work on indicators? How can the principle of common, but differentiated responsibilities be reflected and embedded in the formulation and weighting of indicators? Seven, systemic issues and structural obstacles are areas that the 2030 Agenda is addressing inadequately. These issues and even those issues addressed in the Agenda – like climate change, the protections of oceans and land ecosystems and biodiversity – are mainly dealt with in gatherings and platforms outside the official follow-up mechanisms of the 2030 Agenda. Accordingly, the monitoring and implementation of the 2030 Agenda will have to be addressed both inside the 2030 Agenda follow-up mechanisms and outside at other policy processes and venues. Eight, any approach to address the systemic issues and structural obstacles to the implementation of the 2030 Agenda needs to be centered on the rights and needs of peoples. Accordingly, local and national circumstances have to be taken into account. They can serve as basis for alternative approaches to shaping policies, as is the case in many cities and communities, both in the North and the South. Nine, there is a need to be vigilant about the encroachment of corporate interest in shaping the agenda. It is very clear that in the 2030 Agenda, there is a shift of the big role of private and business sector from the public sector role in pursuing the agenda. The underlying thinking is that the public sector can benefit not only from greater private resources, but also from private “efficiency” and “effectiveness.” There is a need to be critical about this thinking because not factored into this equation is how inefficient and ineffective large private actors have often been in sustaining public goods and upholding human rights. Ten, there is an urgent and compelling need to find ways to depart from development as usual, starting from our own vision of the future to the means of achieving it. We need to radically change what we value most in life in light of the cyclical unwanted outcomes that we are getting regardless of all the good intentions. Indeed we must find ways to change everything that causes the unbearable human suffering around us and the increasing threat of climate change to our very existence.